There is one thing that I truly believe all women will agree on: staying forever young! I have never heard a person say "I am so looking forward to having lines and wrinkles". We all strive to look our best and feel and look young. For today's beauty tip post I have teamed up with Olay to share some tips and tricks of what keeps me looking but most importantly feeling young. Let's start on the outside for a second. Ever since I was a little girl, I was always reminded by my mother to protect and take good care of my skin. That meant wash your face 2-3 times a day, use a great moisturizer daily. Protect your skin from the dangerous sun rays and of course use a scrub 2-3 times a week. To date I do exactly that, I believe that was one of the best beauty secrets my mom passed down to me. Our skin can be so sensitive to the climate around us, whether that's the sun or cold winds. For me, caring for my face has always been a priority and most recently I added an amazing product to my skin care routine: Olay Regenerist Luminous Facial Oil and ladies, I am raving all about it! I use it daily after washing my face and applying my moisturizer. I then add 4-5 drops of the oil and apply in circular motions all around my face. The results are the complete opposite of what I ever expected from a facial oil. I truly thought it would leave my skin feeling greasy and looking shiny. But no, It absorbs to my pores and gives me a healthy, young looking glow that I love. Making me feel and look radiant. This product has quickly become a must-have for my skin care routine and I definitely recommend it to all my friends. That's my secret to fresher younger looking skin! A not-so-secret secret to feeling healthy and young is exercise! And as far as exercise ladies, I try to keep active by taking walks around my neighborhood every chance I get. When I enjoy the day with my son and walking our dog, I love the feeling of breathing in some fresh air and refreshing my mind. I believe walks are essential for the mind and body. This is the easiest form of exercise one can get. It's free and at your finger tips. Now that I am 7+ months pregnant I am beginning to see the benefits of staying active throughout the day. Having a 3 year old also helps me keep active, he is constantly on the go and there is really no chance to rest - but I love that because subconsciously my mind and body are on the go as well... it's a win-win! In recent years anything and everything organic, green and healthy has become a trend. A trend that I hope will not go away because I enjoy having all these amazing ideas, recipes and products at my finger tips. Every week, a couple of times a week, I make myself and my son a green juice. We love it! The possibilities are endless. You can pretty much add anything to your green juice, here's what my essentials are: spinach, green apples, broccoli, bananas, pineapple. If I don't have a chance to actually make the juice, I always keep a bottle of my favorite green juice in my fridge. So anytime I am tight on time, I just grab it and go. I have to admit, in my most recent years I have become a huge fan of water. I shamefully didn't drink enough water in my younger years. That's a no-no ladies. It is all about getting used to it. I started drinking water more and more as the days progressed. And now I feel like I need it... which yes you really do. Water is key to a healthier body as well as great skin. No matter how old you are, water is essential. I have noticed a difference in my skin the last few months as well as my energy. So this is definitely a super easy must-have for me. 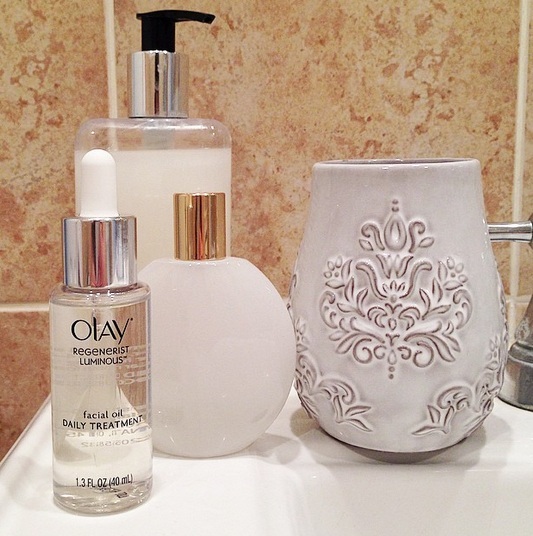 First: It is essential to take care of our skin by using a great moisturizer and facial oil (I recommend Olay Regenerist Luminous Facial Oil). Second: Stay active any way you can! Whether you are a mom or not, find ways to have some sort of exercise daily. Walk, go to the gym , do an exercise home video... or like me, run after your 3 year old! Third: Drink healthy! Green juices are all the rave for a reason. They are delicious, easy to make and super healthy for all of us. If you don't have the time, there are so many options to buy these already made. Last: Hydrate yourself! Water is the key to feeling healthy, energized and looking youthful and fresh! You should drink at least 8 glasses of water a day. If you are not a water lover (like I was) start slowly, believe me, you will be craving water very soon. Just all about getting your body used to it! 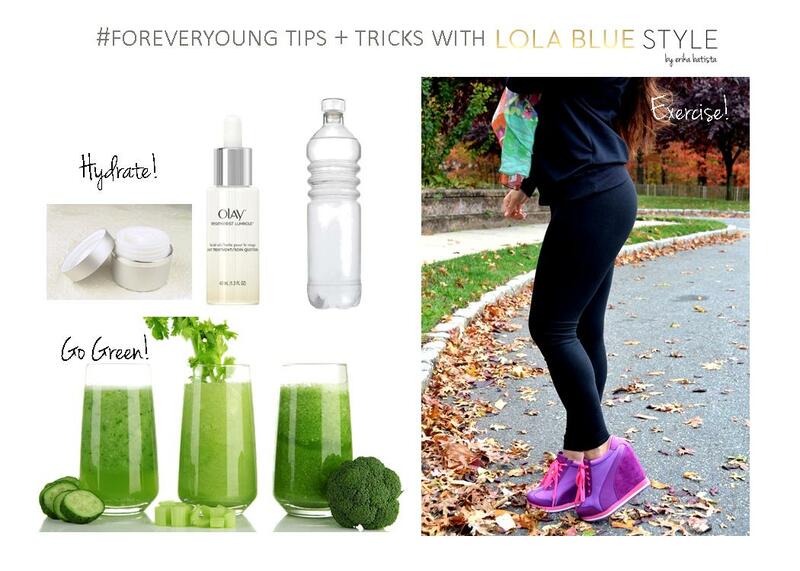 Do you have any secret tips and tricks on how you stay looking fresher, younger and feeling healthier?